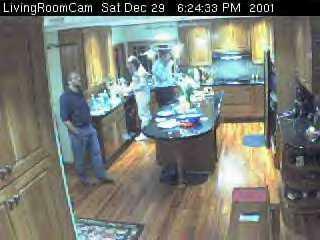 Normally the LivingRoomCam of a mild mannered American household, Christmas time causes a transformation into ChristmasCam!! There are Christmas lights around the house, garlands over the windows and a Christmas tree that we open our presents around on Christmas morning. Come and enjoy our tree and join us for Christmas. If you don't believe in Santa Claus, in 1995, we even caught Santa Claus leaving presents out our house (RealMedia video) . We didn't ever catch him again -- we think you can only fool the Santa guy once. Merry Christmas!! 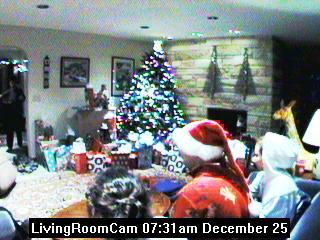 Well, the presents are open, much candy has been eaten, and the kids are already bored with their toys. We had a few visitors to the chat room and exchanged greetings with England and Germany as well as places in the USA. Now to think about cleaning up the house for the party next weekend. Well, maybe a nap first. I've set up a chat site for chatting with us on Christmas morning. Stop by and say "hi". Presents are collecting under the tree. It's time to stop shopping -- the stores are just too crowded. RSVPs are coming in for the Holiday Party! Only 8 more days until Christmas! Trying WebRing now that it's independent again. Still liked the old format. Planning a Holiday Party for December 29th. Be sure to stop by. The tree is up! Merry Christmas!! We can be found as http://christmascam.us. "cx" is the Christmas Island domain. Cute, huh? Yes, there is no Christmas Tree. Couldn't get the family out in the rain to get a tree. We'll have it up next weekend, promise. Votes are piling up in favor of the east end (see below). GE came to fix, ordered a part but hasn't asked for money yet. Looks like the part they replaced 6 months ago may still be under warranty. About.Com:Internet Conferencing -- excellent information on how to put up a web cam, the types of hardware that's out there and the software to use.